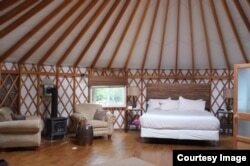 Pictured here is a yurt at a glamping resort. Glamping allows you to enjoy nature but with more comfort -- much more! For many people, camping is a popular outdoor activity. Camping is for people who like to feel one with nature. They like sleeping, playing, eating and washing (or not washing) in the open air. In fact, they often like camping a lot more than staying at home. Camping is not always easy. But people who like camping like roughing it. In other words, they don't mind leaving their creature comforts at home. For example, they do not mind sleeping in a tent on the ground. They don’t mind cooking and eating outside -- or doing anything outside. But not everyone likes sleeping on the ground or washing up in a cold lake. Even people who like being out in nature may still like to get a good night’s sleep on a soft, comfortable bed. For these types of people, glamping may be more appealing. "Glamping" combines two other words, "glamour" and "camping." I have been camping. But I have never been glamping. My friend Lisa has. So, I invited her into the studio to describe her glamping experience. Here is part of our conversation. ANNA: What is “glamping”? How would you describe “glamping”? LISA: Well, “glamping” is actually “glamorous camping,” right? So, that’s where glamping came from. 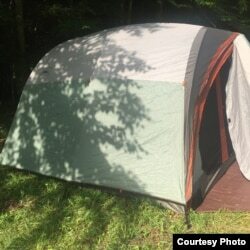 So, it’s camping without all of the downsides. ANNA: Would you consider yourself a “glamper”? Have you glamped? ANNA: We don’t really use the word that way, do we? ANNA: It’s a new word. LISA: It is a new word, I think. I have gone glamping. And we went to this fabulous resort with these yurts. It’s a big round circular tent with like a wooden frame. But this particular yurt has under-floor heating and like a beautiful spa bathroom and a wood stove and fuzzy bathrobes hanging in the corner. What else do you need? And baskets of muffins delivered to your doorstep in the morning. ANNA: That does not sound like camping. But yet, you are outside sleeping in a fabric enclosure – a yurt. ANNA: Yeah, it would be hard to go back to camping once you’ve been glamping, I have to say. LISA: Yes, I think that’s very true. In fact, it may be possible that I have not been camping since I went glamping. ANNA: So, Lisa if you’re free this summer how would you like to go camping with me? LISA: I would much rather go glamping with you. How do you feel about glamping? ANNA: The way that you've described it, I could do glamping for a longer period of time than I could camping. I do like camping. But glamping sounds really awesome. LISA: Glamping is fabulous. And if you’re doing it right, there’s a restaurant nearby so you don’t even have to cook. This is the wood-framed yurt where Lisa stayed on her glamping trip. And this is my tent for when I go camping. Now, there is no reason you have to choose between camping and glamping. Perhaps you like to do both. You have your feet in both camps, so to speak. When you have your feet in both camps, you are supporting or are involved with competing sides -- or at least two very different sides. Sometimes, we use this expression when supporting both sides is a good thing. For example, let’s say two friends of yours are having a big fight, and they stop talking to each other. You, however, want to stay out of the conflict. So, you talk with both of them. You keep your feet in both camps. But sometimes the expression carries with it the feeling that there is something dishonest going on. In other words, maybe a person is supporting both parties but not saying so. I imagine that this happens in the world of politics quite a bit. But let’s not end this Words and Their Stories in politics. Let’s go back to nature. Which camp are your feet in: camping or glamping? I’m Anna Matteo. Special thanks to my friend Lisa for joining me on the program. spa – n. a place where people go to improve their health and appearance by exercising, relaxing, etc. fuzzy – adj. pleasant or comforting : covered with short, soft hairs, fur, etc.